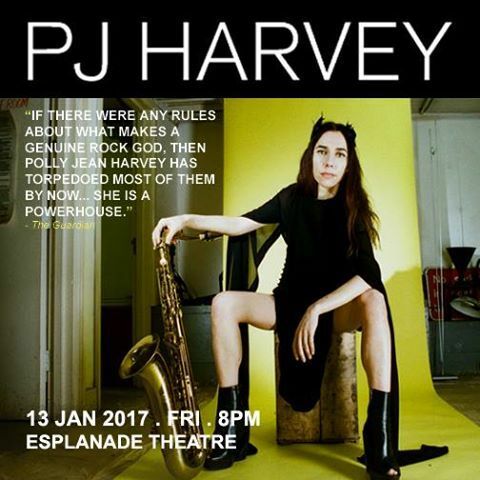 Truly a breath of fresh air amongst all the big concert announcements for 2017, famed singer-songwriter PJ Harvey is set to perform in Singapore for the very first time in January. As the only Southeast Asian stop on her ongoing tour, supporting her ninth studio album The Hope Six Demolition Project, the British musician will perform at the Esplanade Theatre with her full 10-piece band on January 13th. This is the first show under the Mosaic Music Series banner in 2017, alongside album launches by Piblokto and Bennett Bay. PJ Harvey has had a successful career since the release of her debut Dry in 1992, when she was only 23 years old. Since then, she's been one of alternative rock's most influential figures and a creative powerhouse in her own right. She has also had extensive collaborations with Nick Cave and John Parish, and her 2011 album Let England Shake earned her the coveted Mercury Prize, beating Adele and James Blake to land her second win and fourth nomination overall. Her music was also a central presence in the soundtrack of period TV series Peaky Blinders. Tickets are priced at S$148, S$118, S$88, S$68, with special prices for students, senior citizens and Esplanade & Me cardholders. They're now available through SISTIC.